> Our time in Kabul was so full. Appointments up to the last minute even on the way to the airport. We were fortunate to be able to keep our very American work schedule on Afghanistan time. Many laughed at all we tried to fit in but in some miraculous way it all worked, including a few unplanned appointments like meeting with a family over breakfast that I had been emailing for two years. When we discovered over breakfast we knew each other via email we knew we were supposed to meet at this time. 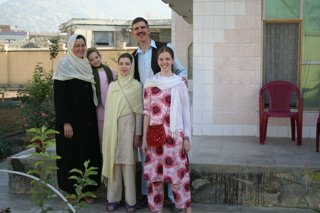 This family was in another region of central asia and had recently relocated to Afghanistan. Carolyn went with us to several trainings as an observer. The photos here are from our last two days, maybe photos are worth a thousand works, as it is becomming harder to describe how fortunate we feel to be allowed to have had the privilege to meet so many amazing people and participate in their lives in this way. One night before we left I had a last appointment at my guest house with someone from Rastagar Carpets. It was 10:00 PM, he asked me if I was exhausted, from our day as he was a part of a couple of appointments. My immediate response was "NO- this is what I was made to do". Being in the US focusing on operating and organization and fundraising…now that is exhausting. The delight I feel from being able to do what I was made to do humbles me and blesses me.